Devon conservation charity, Moor Trees, celebrated the planting of 60,000 native trees since they were founded in 1999 at a special ceremony led by Adam Watson Featherstone, founder of Trees for Life in Scotland. 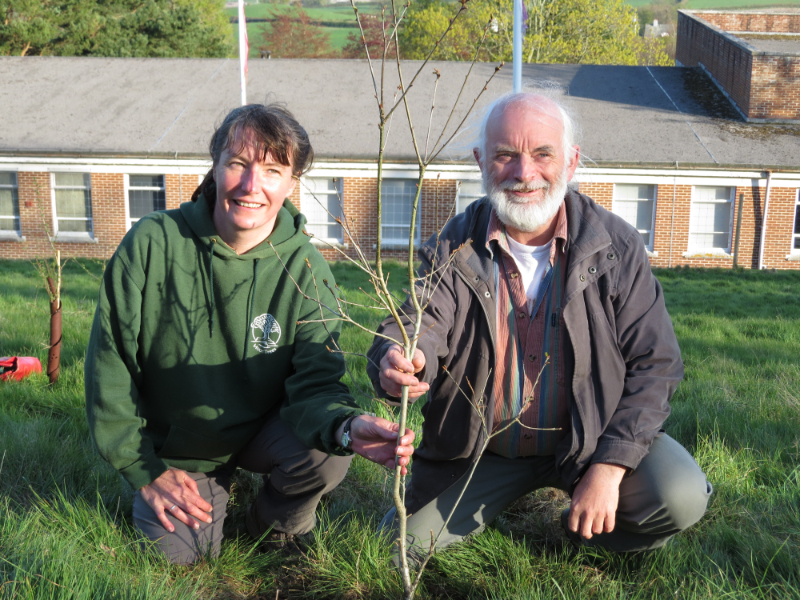 He planted a native oak tree, grown from local seed, at Howton Down, Seale Hayne, Newton Abbot, where Moor Trees are working with the Dame Hannah Rogers Trust to create 13ha of woodland to be enjoyed by the local community as it grows and flourishes. Since it began creating native woodland in 2000, Moor Trees has planted native broadleaf trees on hundreds of acres around Dartmoor and the South Hams. Volunteers turn out on Sundays throughout the winter months to plant oaks, rowan and other local species, grown especially in nurseries at Dartington and near Diptford from seed collected in the area. ‘It is a real tribute to the hard work of our volunteers to be planting this oak tree as a mark of our success over the last fifteen years. It is also a recognition of all the landowners who have worked with us to reach this milestone.